One good thing about the seemingly endless summer we’re having is the many opportunities to quench our thirst. This summer’s hottest drink has no doubt been the gin and tonic, with bar shelves making room for more artisanal spirits and tonics – made locally and abroad – than ever before. 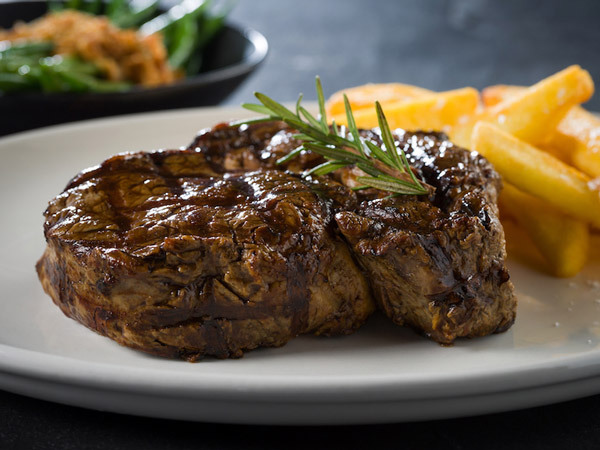 With Mzansi offering everything from Jacaranda trees and tropical forests to glistening sea views and majestic mountains, it’s hard to beat a restaurant that has front-row seats to a view – especially with a G&T in hand. For your next after-work drink or dazzling dinner, we’ve rounded up restaurants with great views where you can enjoy your favourite gin cocktail. The view of the sunset from this rooftop bar in Norwood keeps guests coming back for more. A Bedouin-style tent plus a relaxed ambience makes it a great venue for a gathering with friends. There’s a good variety of drinks, including local craft beers and cocktails, as well as snacks and food from Vovo Telo downstairs. Expect incredible views of Johannesburg at this stylish bookstore eatery. The drinks list is extensive and you’ll find a wide range of carefully crafted cocktails and classy gin drinks on offer. Pick a spot next to the window and enjoy your favourite tipple with stunning views and made-for-sharing food. A meal with a view at the EB Social Kitchen & Bar. Photo supplied. This stylish restaurant and bar offers creative and accessible food in an elegant yet comfortable setting. One of the best ways to enjoy it is for sundowners at the champagne bar, which offers beautiful views of the sunset from the hotel’s fourth floor. David Higgs’s stunning fourth-floor restaurant has a bar that boasts gorgeous views of the city no matter the time of day. The in-house sommelier can help you choose a wine, or you can opt for one of the stylish cocktails. 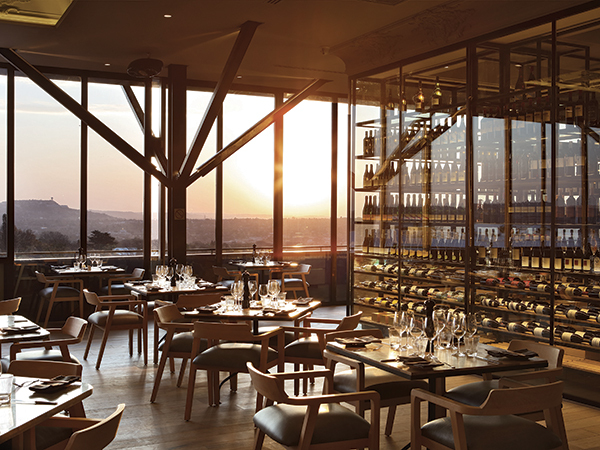 Tables at Marble’s windows offer a bird’s eye view of Rosebank. Photo supplied. While this stylish suburban bar doesn’t offer views of the cityscape, you’ll still catch a killer Jozi sunset while sitting out on the deck. Grab your craft beer, wine or delicious gin cocktail at the buzzing bar and perch outside for the evening. If you’re peckish, there are great cocktail-style bites with a Mzansi twist. 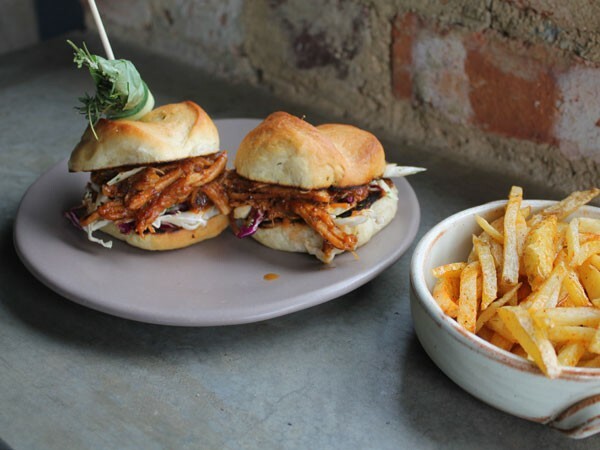 Think deep-fried pap balls, sticky chicken wings and shredded lamb-shoulder sliders. Delicious pub grub at Parliament. Photo supplied. 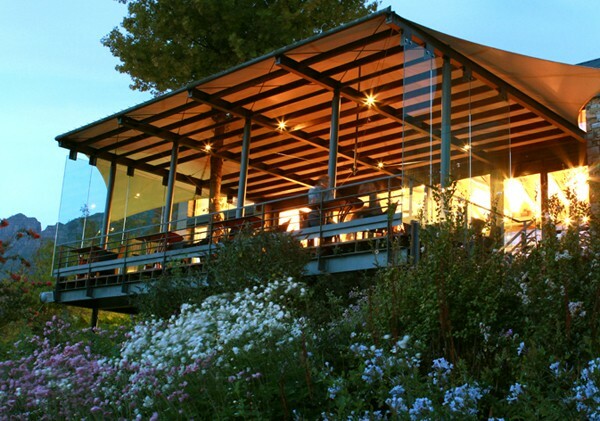 Few things are more luxurious than enjoying a meal in a small piece of wilderness right in the middle of Pretoria. 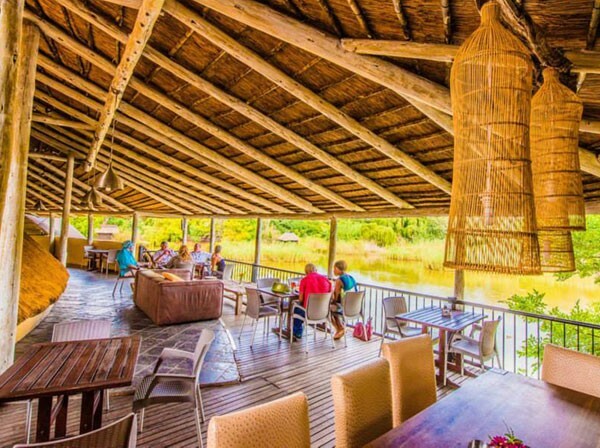 The surrounding park and restaurant deck overlooking a nature reserve make Blue Crane great for a lingering lunch with tranquil views. Lunch with a view at Blue Crane. Photo supplied. 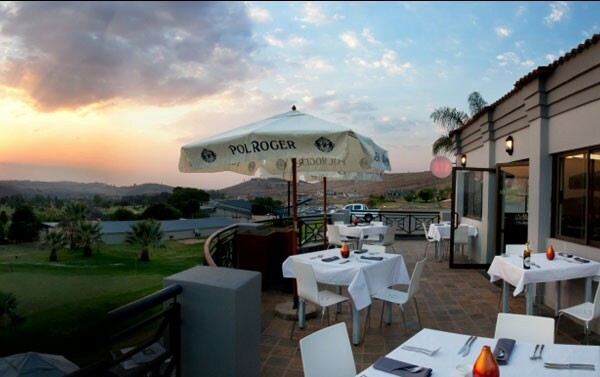 This huge venue offers tables inside and out on the stoep, which looks out over the city. The simple décor reminds guests to take in the surroundings of magnificent indigenous trees and bushes. Sit on the deck with your drink of choice and sample easy-eating appetisers like roasted potato wedges, beer-battered chicken strips, and spicy jalapeño poppers with bacon jam. The restaurant also runs a gin-and-sushi evening on selected Thursdays. This spot offer spectacular sunset views, and the bar is well stocked with an impressive array of cocktails. Enjoy your drinks on the veranda before heading inside to savour the elegant seven-course tasting menu. The beautiful views at De Kloof. Photo supplied. 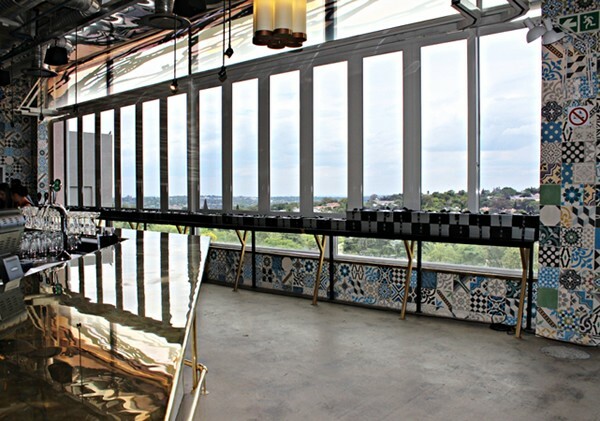 The view over the Waterkloof valley is spectacular at this glam spot. The entire restaurant is built on the rooftop, with most of the outside area covered, offering protection from the elements. There’s also live music and a brilliant beverage selection for after-work drinks. Sip on gin cocktails like the Raspberry Collins or the Basil Smash made with fresh basil leaves and dry lemon. This Camps Bay hot-spot buzzes with the in-crowd. Alongside stunning Camps Bay views, you can expect food and drinks with international influences and a South African twist. Grab a spot on the terrace and enjoy sundowners and the sights of Camps Bay, and stay for a night on the town with live entertainment from local and international DJs and musicians. 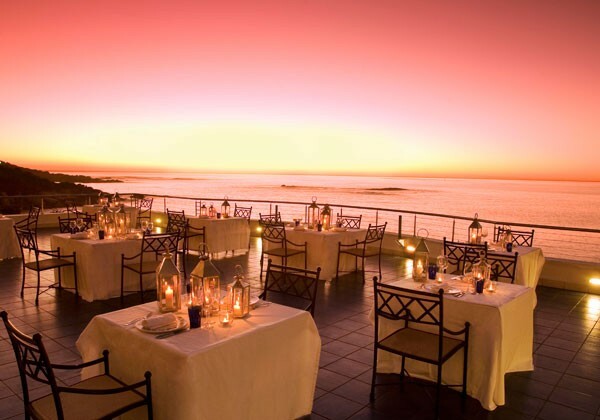 Situated at The Twelve Apostles Hotel on the winding road between Camps Bay and Llandudno, this fine-dining restaurant boasts breathtaking views of the Atlantic Ocean from its large outdoor veranda. The attached Leopard Bar is the ultimate spot for sundowners or boozy high teas. Sunset views at Azure at The Twelve Apostles Hotel & Spa. Photo supplied. This second-storey spot is still a top pick for locals and tourists. The beautiful beach views are a draw card and match the crisp white interior. Enjoy an abundance of fresh seafood, pastas and meaty fare inspired by the Mediterranean while you sip on cocktails and crispy wine. The views here are magnificent. 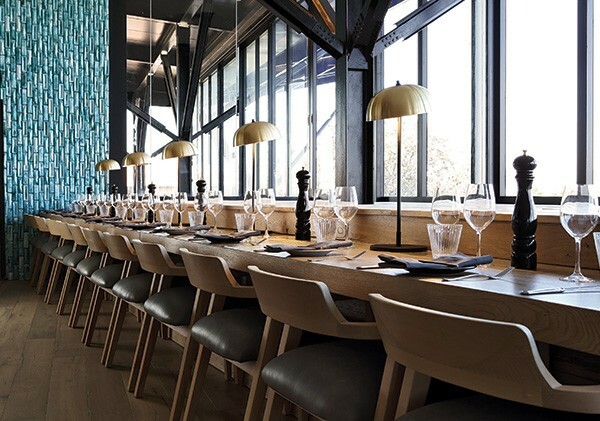 The large glass windows that frame uninterrupted views across False Bay to the Hottentots-Holland mountains form the perfect backdrop for chef Ivor Jones’s immaculately presented and flavourful food. 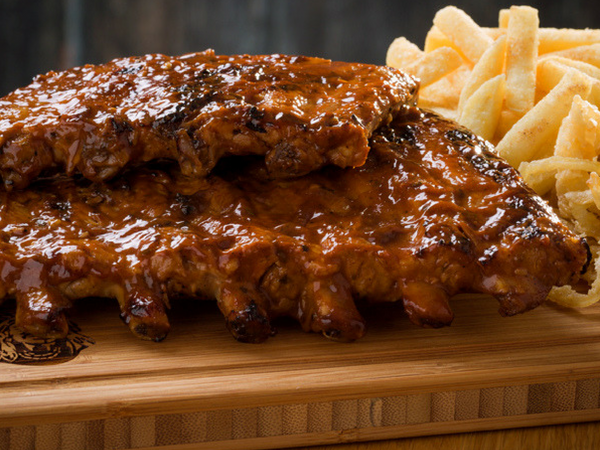 Book a spot for an early dinner because you’ll want to watch those mountains turn purple at sunset. Floor-to-ceiling windows make the most of the view over the Constantia wine valley. Photo by Amy Ebedes. 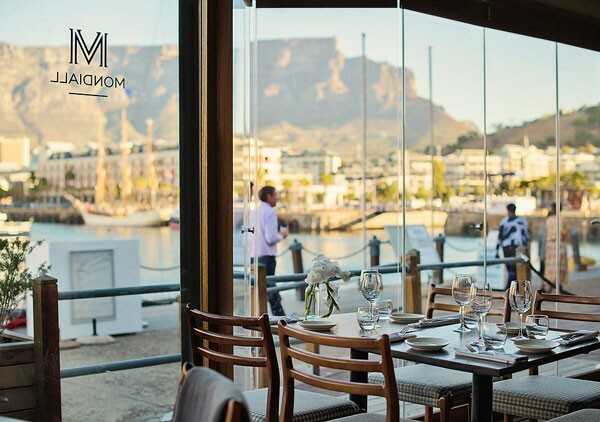 This classy Waterfront option boasts some of the best views of the harbour and boats with a glowing backdrop of Table Mountain. 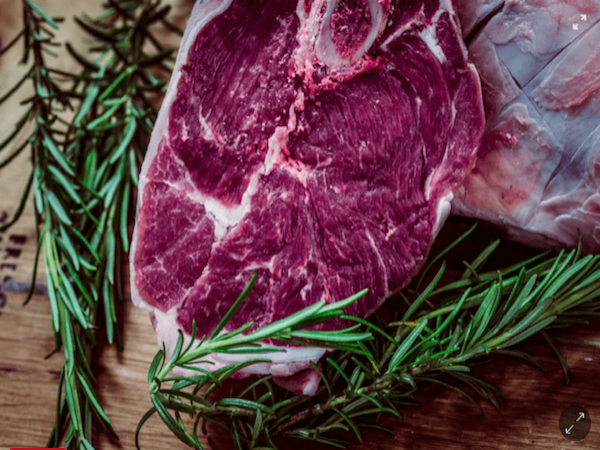 The food includes delicious options such as Wagyu beef burgers with umami ketchup, game-fish tacos, battered fish with golden chips, and lush seafood risotto. Before settling in for dinner, order a thirst-quenching cocktail from the gleaming bar and take in the beautiful views. Views of Table Mountain from the harbour side of Mondiall. Photo supplied. This already popular space on the rooftop of the newly refurbished Silo Hotel offers incredible 360-degree views of the city. Enjoy charcoal-fired dishes, salads or something from the trendy tempura bar while you sip on your choice of drink next to the pool or relax on one of the sunbeds and watch the sun go down. If you can’t get a spot on the rooftop or the weather isn’t great, The Willaston Bar also offers gorgeous views of the cityscape. Reservations are required at the Roof Top Bar and numbers are limited. This stylish new cocktail lounge is situated in the entrance to The Bay Hotel and has glorious views of the Camps Bay strip. Perch at the bar in the classy interior or grab a spot on the busy sidewalk and people watch, cocktail in hand. Opt for a delicious gin martini and or a gin with one of the interesting tonics. The deck at this stunning Stellenbosch restaurant overlooks the curve of the vineyards and a sprawl of lush farmlands towards the Mother City in the distance. The modern and bright interior with its glass walls on two sides also offers spectacular views from inside. 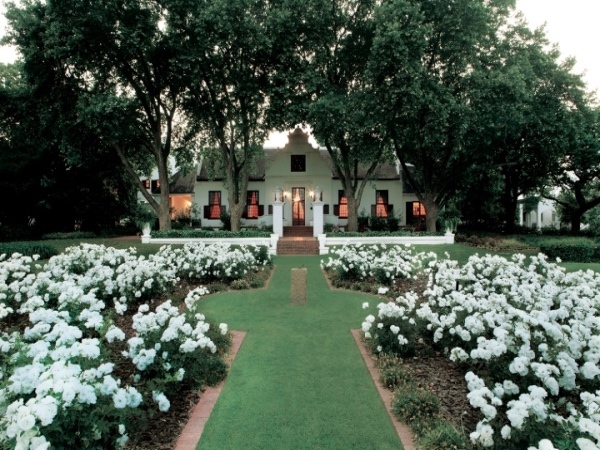 Chef Richard Carstens serves innovative and bold dishes paired with wine from Tokara and other top estates. The deck at Tokara. Photo supplied. 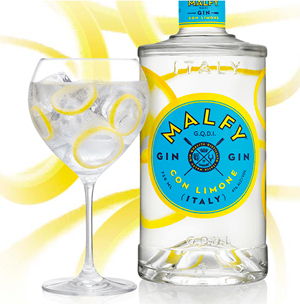 Malfy Gin, which comes from Italy, is infused with Italian lemons and juniper from Amalfi coast and offers a taste of the Mediterranean. 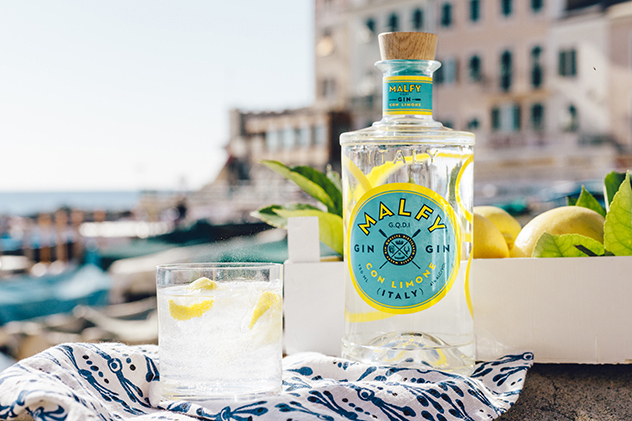 Malfy Gin believes in one thing: Sipping on the perfect G&T surrounded by sunshine with a beautiful view or watching the sunset is the key to a perfect #MalfyMoment @MALFYGINSA. I am a total Gin freak, love this sooo much but you have left off two VERY hot Pretoria Gin spots, Carbon Bistro and Culture Club!! Toni’s is also serving some really good Gin cocktails as does Delicious/Carlton Café…..just saying…..
Wow, the Cape Town views look spectacular. The deck at Tokara -WOW! 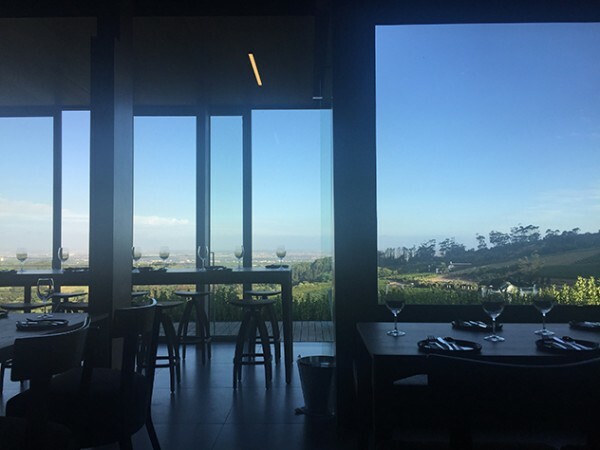 My favorite sunset spots with a good G&T is The 41-Camps Bay or Chefs Warehouse at Beau Constantia and then in the beautiful wine lands where i work is, Tokara with goooood food. A compilation of my favourite spaces.